In small numbers, bats aren't much of a problem. It's when the colony grows in size that real problems start to occur, and they mostly have to do with guano buildup. However, even if you only have a small colony, it's best to deal with it as soon as possible. Bats live a very long time, and they stay in the same place basically forever (thousands of years, conditions permitting). The colony grows larger every year, as the female bats have babies each summer, and those babies join the colony. After a period of years, you can have thousands of bats, and that's where the problems start. Problems caused by bats in houses range from minor to life threatening. Hearing occasional squeaking or the rustling of bat wings in your attic, chimney, or walls can be a nuisance, and even a bit unsettling. It is also disturbing to find a baby or adult bat in the living areas of your home. If a bat is stuck and dies somewhere in your walls or elsewhere in your home, you may smell the unpleasant stench of the decaying bat. These problems are minor, but should not be ignored because eventually larger problems will develop. A larger problem with having bats in your house is the strong, unpleasant odor that results from the droppings-called guano, which the bats leave. If a colony of bats is living in your home, then there is a minimum of 30 or 40 bats leaving behind droppings on a daily basis. As the piles of guano accumulate, the odor can begin to permeate throughout your home. 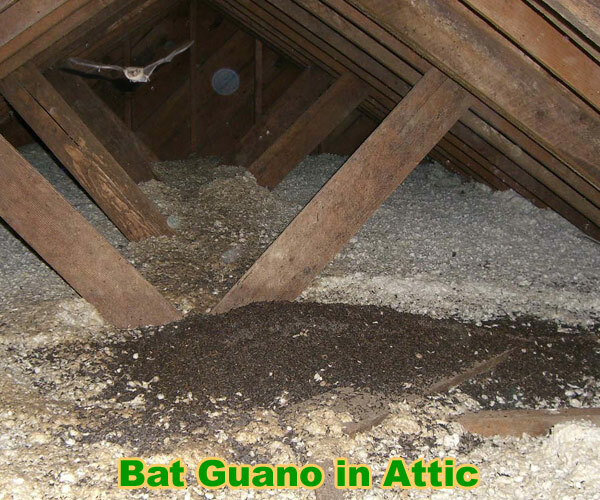 The odor of the guano is bad, but guano also carries a threat to your health that can be fatal. Bats can also damage your home. They can chew into walls, damage insulation or damage wiring as well. Bat guano is a carrier of the fungus histoplasma capsulatam. The spores of this fungus are microscopic and airborne and they can easily get into the living areas of your home. If inhaled, the spores of the fungus can cause a disease called histoplasmosis, which is an infection of the lungs. Sometimes the infection will clear up on its own, but it can also develop into chronic lung infection, which requires treatment. If left untreated, the disease can cause the infection to spread to other organs of the body, which can be fatal. Another serious risk from bats, although rare, is the possibility of a bat transmitting rabies to a human from a bite. Rabies is a virus that causes inflammation of the brain, and it is fatal if not treated soon after infection. Few bats actually carry rabies, but it is not possible to tell just by looking at one if it is a carrier. If you are bitten by a bat inside your home, or anywhere else for that matter, you should begin rabies treatments right away. If you see, hear, or smell evidence of bats in your home, you first need to figure out where they are entering your home. Then you will need to remove the bats from your home and prevent them from returning, and return they will if your home is not sealed off properly. If your attic is very warm, or if you live in an area that is warm all year, the bats will never leave, except to go out each night to feed. If you live in an area that is colder seasonally, the bats may migrate for the winter, but they will return when the weather warms up again. To find the entry point, or points, of your home, look for evidence of bat guano or urine on the exterior of your house. 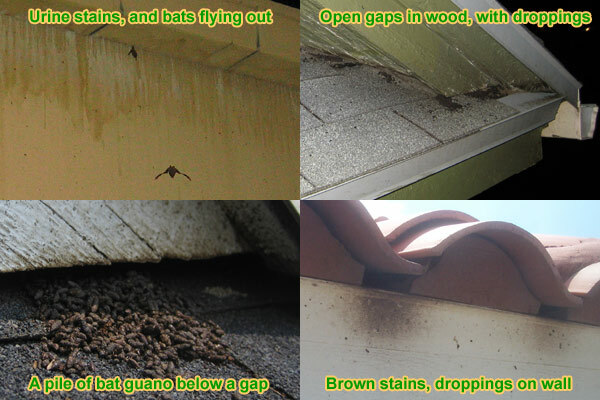 If there is a lot of guano on a particular wall or an area of your roof then that is likely where the entry point can be found. The same is true for urine stains; if you see a lot in one area, it is likely that the bats are entering and exiting very near that spot. You can watch your house at dusk and wait for the bats to exit your house on their nightly hunt for food. They will almost always leave as a large group, so if you are looking in the right spot, you won’t miss them. If you can’t catch them exiting, examine your home closely for areas where the bats may be entering and exiting. You will likely need a tall ladder for this as bats prefer heights where they are safe from predators and they have room to take flight. Bats can squeeze through an opening that is only 3/8 of an inch large, so you must be meticulous in your search. Common entry points are ridge caps, vents, and gaps in eaves and fascia boards. You should also examine thoroughly any areas of your roof or structure that may be damaged, allowing for bat access. This could be a broken window, loose board or piece of siding, or a missing or broken brick. It is illegal to fumigate bats or to hurt them. It is also illegal to seal bats out of your home during seasons when there could be flightless baby bats still in the roost. You need to get the bats out, and you need to seal off the entry points, but these things must be done legally and humanely. You can wait until the babies are grown and are flying out nightly, and seal your home then. You can also wait until they migrate, and have your home sealed off before they come back.